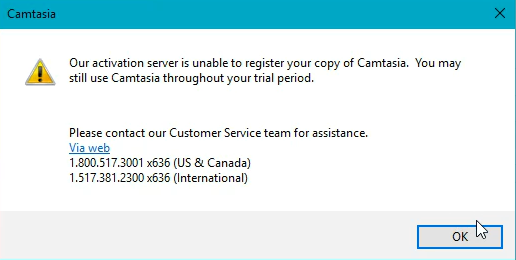 Camtasia (Windows): Activation server is unable to register your copy of Camtasia. This problem can occur if the hosts file has been modified on your system. Browse to this folder: C:\Windows\System32\drivers\etc. Right-click the "hosts" file and select Properties. Uncheck the box for Read-only. Download the attached CamtasiaUtl.zip file to your desktop. Right-click the zip file and select Extract to extract the EXE file. A spinning wheel may flash after running the file, but you will receive no other message or prompt. Open Camtasia and enter your valid software key. Watch the video to see the steps above.